From the earliest times, the Ĩyãħé Nakoda were one people. Historically, they traversed their traditional homeland in smaller nomadic groups. As hunters and gatherers, smaller groups could more effectively harvest game and resources in the Rocky Mountains and along the foothills. Each group had a leader, or Head Chief. At certain times during the year, these groups gathered together at specific locations for celebrations, spiritual occasions, and warring parties. Also when the Ĩyãħé Nakoda reunited, they engaged in large buffalo hunts on the open plains. After Confederation in 1867, representatives of the Dominion of Canada and the Crown (the British Monarch, Queen Victoria) negotiated Treaties with Indigenous groups across the prairies to the Rocky Mountains. The intent was to broker peace, and to have the Indigenous groups share their ancestral lands. In return, they would receive various kinds of payments and promises. Land in the west would then be made available for settlement by European immigrants to Canada. In 1877 at the signing of Treaty 7, the Ĩyãħé Nakoda were predominantly represented by three Head Chiefs. These Chiefs made their marks on the Treaty document, based on the belief they were agreeing to put down their weapons to make peace, with no interruption to their use of traditional lands. The Ĩyãħé Nakoda were later assured they would retain three large tracts of traditional homeland, one for each group. However, the government of Canada subsequently recognized the signings with one land entitlement, rather than separate land for each group. 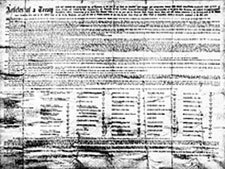 The Ĩyãħé Nakoda are the only Indigenous people in Canada that, after signing a Treaty, were assigned a single land allocation for three individual groups. The Reserve land for the Ĩyãħé Nakoda was surveyed in 1879 and was fenced with barbed wire to outline its boundaries. The Ĩyãħé Nakoda knew the tract of fenced land was much smaller than what their allocation was supposed to be. According to oral history accounts, the missionary Reverend John McDougall played a significant role in persuading the Ĩyãħé Nakoda leaders to sign the Treaty. It was much easier to Christianize and colonize the Indigenous people if they were concentrated in one location. Being forcibly contained and fenced-in was contrary to the traditional way of life of the Ĩyãħé Nakoda.The overall and enduring belief of the Ĩyãħé Nakoda was that Reverend McDougall betrayed them about the spirit and intent of the treaty-making process. Litigation with the federal government continues to this day regarding the actual Treaty Land Entitlement that was agreed to in 1877. 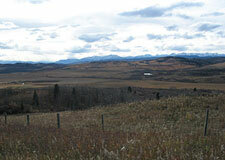 The original Reserve land allocation is adjacent to the Rocky Mountains, west of Calgary, Alberta. It is referred to as the Morley Reserve. It is correctly known by the Ĩyãħé Nakoda as Mĩnĩ θnĩ Wa-pta which means the "Cold Water River". This is in the geographic region where the majority of the clans traditionally settled. During the 20th century, two smaller satellite Reserves were subsequently established for the Ĩyãħé Nakoda. 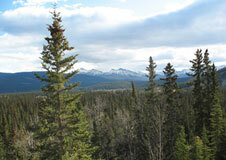 One is located approximately 265 kilometers (165 miles) north-west of Morley, and is called the Big Horn Reserve. 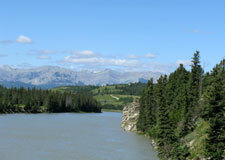 It is correctly known by the Ĩyãħé Nakoda as Kiska Wa-ptadn which means the "Big Horn River". This is in the geographic region where the northern clans traditionally settled. The second is located approximately 120 kilometers (75 miles) south of Morley, and is called the Eden Valley Reserve. It is correctly known by the Ĩyãħé Nakoda as Ga-hna which means "Along the Foothills". This is in the geographic region where the southern clans traditionally settled.